Years ago, General Ravenscroft and his younger wife, Margaret, walked to the cliff near their home in Overcliff. They were found both shot to death with no sign of anyone approaching them. Either the General killed his wife and then himself or she killed the General and then herself. At the end of the day, the case was never resolved but as, even if it were murder, rather than suicide pact, the killer has already received the due justice. Ten years later, Ariadne Oliver is approached about the case, as the daughter of the couple is due to marry and her potential mother-in-law is determined to find the truth of what happened. As Celia Ravenscroft is Ariadne’s goddaughter, she agrees, but given the time that has passed, can anyone truly remember what happened. Luckily, she has a friend who agrees to help her. Hint: he’s from Belgium! The general reaction when I’ve broached this book with my fellow bloggers is on the lines of “Ugh!” Christie’s final Poirot tale (to be written at least) this has something of a bad press. There was still the apparently-dreadful Postern Of Fate to come, but this does not have a good reputation. And for good reason. But it’s not those mistakes that should be picked on. What should be picked on is the plot or lack of it. At one point when reading it, when someone was asked about an event yet again, with virtually no new information being revealed, I suggested to myself that this would make a good short story. It’s pretty short anyway, my copy running to only 160 pages. But then I corrected myself. Because it’s not even a good short story. It’s a terrible one. I would say The Big Four is better than this one, as there although it is an odd mix of thriller and detective work, there is more action and events to get engaged with, rather than the simple but hugely appealing plot of Elephants Can Remember. sorry just read this and I meant to say hugely UN-appealing plot. I have a copy of this one on the TBR it sounds like it should stay there! I am a Passenger to Frankfurt and a Nemesis away from this; my experience of Christie’s later works has been rpetty positive thus far — I’ll find something to enjoy if it’s there to be found — but the received wisdom is that things are about to get a lot worse. Oh, well, I do feel like I owe it to her after the brilliance of the preceding decades, and for getting me into the GAD lark in the first place. The disappointment here, unlike Nemesis, which has other problems, is that there is so little plot here and what there is… I didn’t mention something in the review that isn’t really a spoiler but once you get to it, the solution stares you straight in the eye. You mentioned the speculation that Christie might have been suffering from the onset of dementia by the time she wrote this book. I thought that this throws a different light on the thinness of the plot. The Big Four is a much more entertaining book than this one, that’s for sure! The Clocks should probably be considered a worse book because Christie still seems to have all her faculties there – she just wrote a boring book. But even that one has a few charms in it. I feel for JJ, who has these last three to tackle. 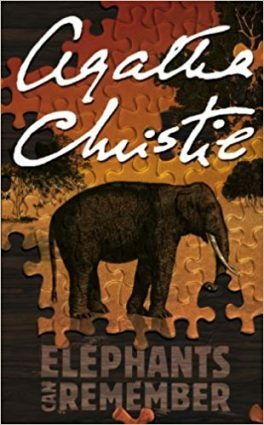 Of the three of them (and this isn’t saying much), Elephants is the best, but as PD says, once a certain quality is revealed, you have to wait for seemingly hundreds of pages before Poirot finally puts us out of our misery and reveals the shocking twist. And then you ask yourself why everyone is gasping in surprise when it’s all been so obvious for so long. But it’s still a mystery, unlike Passenger to Frankfurt which is like a James Bond novel after the Dementors have sucked the soul out of it, or Postern of Fate, which is just a tragedy. Are there charming phrases and sad moments of realization that a great writer is finished to be found there? Sure there are. Enjoy them, JJ. This Christie fan wishes that somebody at Collins had stepped in and helped a sweet old lady out of a jam. I don’t remember The Clocks being *too* bad, but I was appalled by The Big Four and only managed to get through Elephants by listening to the BBC Audio dramatisation. Elephants has a bad plot, Postern has no discernible plot after the first chapter. But arguably the aimless chitchat is more entertaining than anything in Elephants. The problem for me with Postern and Frankfurt is more the sense of trying to peel back the layers of evil and find something monstrous. But the Mr. Browns of WWI are just eclipsed by the reality WWII, etc. so that you feel cheated. At least in Curtain, she concentrates that evil into just the one character, who is NOT the head of some immense world-dominating power. But Curtain was written at the height of her powers, despite being published last. I’m not a fan of it, but it’s a much stronger book from a much stronger writer – young Agatha Christie. Yes, know that. But it’s the immense, unseen “power” that really doesn’t work for me at all — And what is that other one where a woman who wanted to commit suicide is sent on a mission to rescue people held somewhere in the desert? That is the kind of thing I mean. Destination Unknown. That’s what I said on my blog. It starts out like an Eric Ambler and turns into an Edgar Wallace. Hokum. What a coincidence! I’m currently reading “Elephants Can Remember” and what do I find? A post about the very same book that I’m reading! I’m enjoying the book and of course there are some flaws but overall it’s a great book. There are certainly some weaker Christie books. I only read “Elephants” once but I can’t fully remember the solution to the mystery. Maybe as I continue reading closer to the end the memories will return. Who knows! The mystery is intriguing and I’m trying to piece together in my mind what actually happened. What’s funny about the title is that even though people and their memories are often compared to elephants, like elephants we can remember things but unlike them our memories are not as sharp, perfect, or clear. Our memories can be disjointed and details can be omitted or exaggerated. Destination Unknown – Finally remembered (sic). I really liked this when I was 10, and gave it to my father to read. Mistake!